Fiber preparation with lactic acid bacteria and blueberry powder. Dietary supplement. 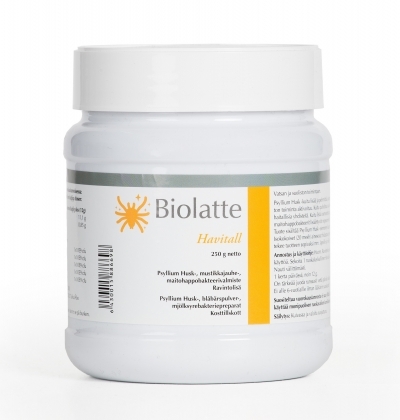 Mix 1 tablespoon of Havitall powder with 4 dl water. Take immediately. Once a day, appr. 12 g. We recommend that you drink a lot of water during the day. Do not give to children under 6 years old. NOTE! Shake the jar well before each use. The husk of the psyllium seed is a non-soluble neutral fiber containing a mucus which is swollen when in contact water. With its high granularity (20 mesh), and being non-degradable, it is safe and facilitates the intestinal transit.